San Mateo, Calif. (August 21, 2016) – Friends of Calakmul (FOC) conservation organization announced today an agreement with a cooperative of indigenous landowners to protect 57,080 acres of rainforest in the Calakmul Biosphere Reserve on Mexico’s Yucatan Peninsula. The parcel of land, within the second largest rainforest in the Americas, is an addition to the 200,000 acres of land FOC has already protected and a big step toward its goal of protecting 350,000 acres. The Calakmul Biosphere Reserve, covering 1.8 million acres, is home to the second largest Jaguar population outside the Amazon rainforest. The addition of this protected land – known as the Pustunich Ejido – means more critical habitat will be available to the endangered big cat. Although the Calakmul rainforest has been officially designated a reserve, only the core government-owned core portion of the 1.8 million acres has been strictly protected. The remaining 1.2 million acres of rainforest and all the wildlife within it remain threatened by illegal logging, slash and burn agriculture, poaching and development pressure. Together with Dr. Ceballos, San Francisco area husband-wife pair David Leventhal and Sandra Kahn founded FOC in 2001. Their partnership to protect the reserve’s biological treasures has grown to include many concerned public donors and alliances with like-minded groups including Conservation International, Global Heritage Fund and D&R Greenway Land Trust of New Jersey. A key component of FOC’s success has been the use of an innovative approach to conservation: long term conservation easement agreements. These legally-binding agreements provide a yearly payment to indigenous landowners in exchange for a guarantee to leave the forest lands and other natural resources undisturbed. These agreements offer both a better economic alternative for the community in the short term and an opportunity to invest in one of the most important eco-systems in the Americas and protect it for future eco-friendly development opportunities. In addition to jaguars, more than 90 mammal species live in the reserve, including the puma, ocelot, howler and spider monkeys, margay, hawk eagle, as well as crocodiles and hundreds of migratory bird species. US birdwatchers know the area’s nesting grounds are critical for songbirds who return to the US from their winter habitat in Calakmul each spring and summer. 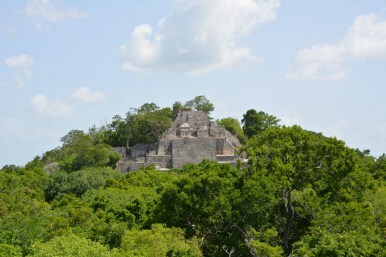 The Calakmul Biosphere Reserve is also the site of the Calakmul ruins, considered to be one of the most important Mayan cities ever discovered. Friends of Calakmul (FOC) is a San Mateo, Calif. based conservation organization actively working to preserve jaguar habitat in the Calakmul rainforest of Mexico’s Yucatan Peninsula. Supported by concerned scientists, environmentally conscious individuals and an alliance of US organizations, FOC partners with indigenous communities to preserve and protect Calakmul’s unique environmental heritage for future generations. For more information, please visit: www.calakmul.org.